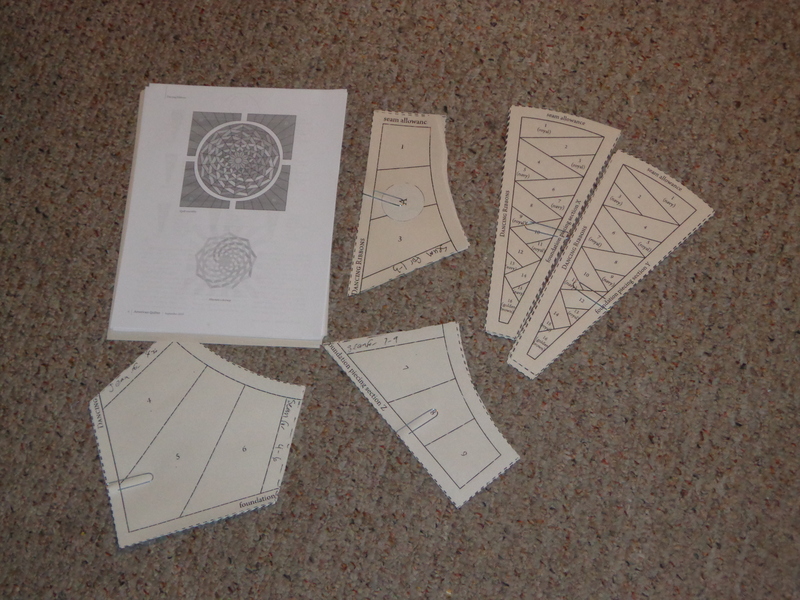 It’s finally out, the post March A long Report, plus some discussion of my projects, a tiny bit of paper piecing advice in addition to the project. 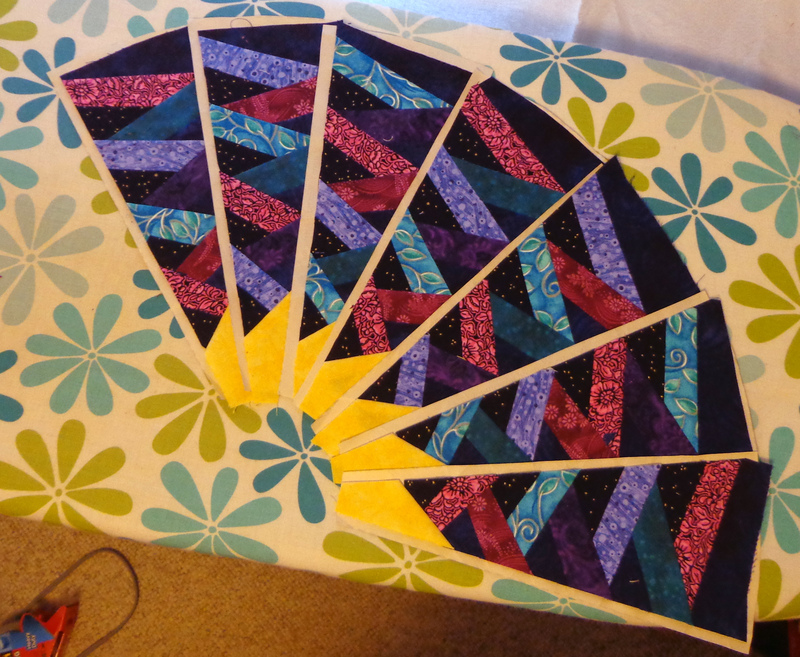 During the month of March, we try to quilt for 15 minutes, building our ‘quilting muscles’. If you listen to the podcast, the first 20 minutes or so I recap some of the achievements we accomplished in the month of March. Here are the links to the past March A Long posts where people reported their progress. You did it! So did I! Congrats to everyone who worked toward this wonderful hobby. I am currently listening to the Ender’s Series on Audible by Orson Scott Card through audible. There are many books to listen to, the story is science fiction, also somewhat political (one story arc), some are older books, some are newer – great audio drama due to multiple people reading the story! 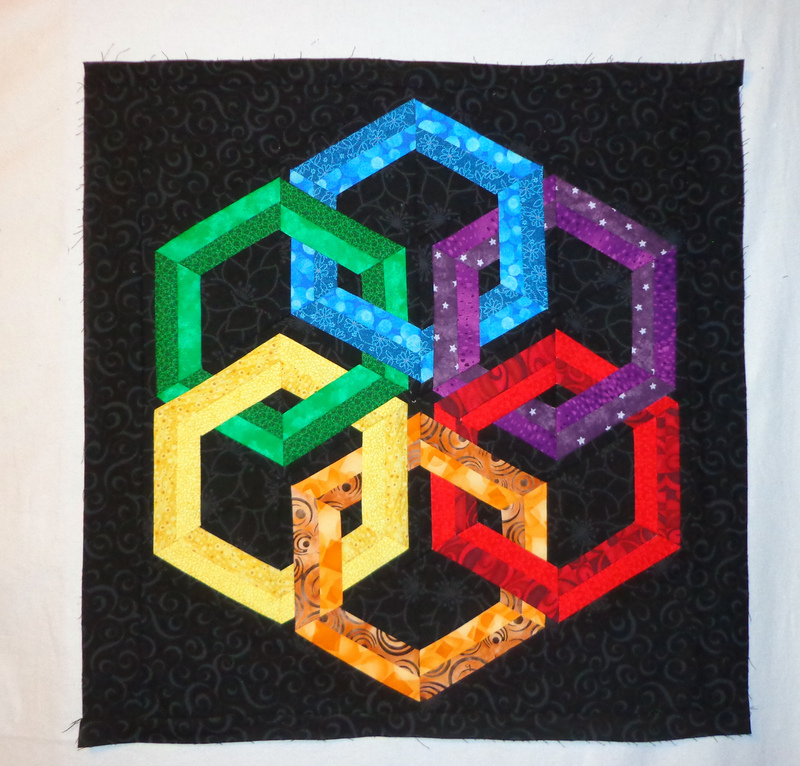 I am working on my Quilters Healthy Choices #QHC by doing more exercise in the last 5 months than the previous number of years combined. 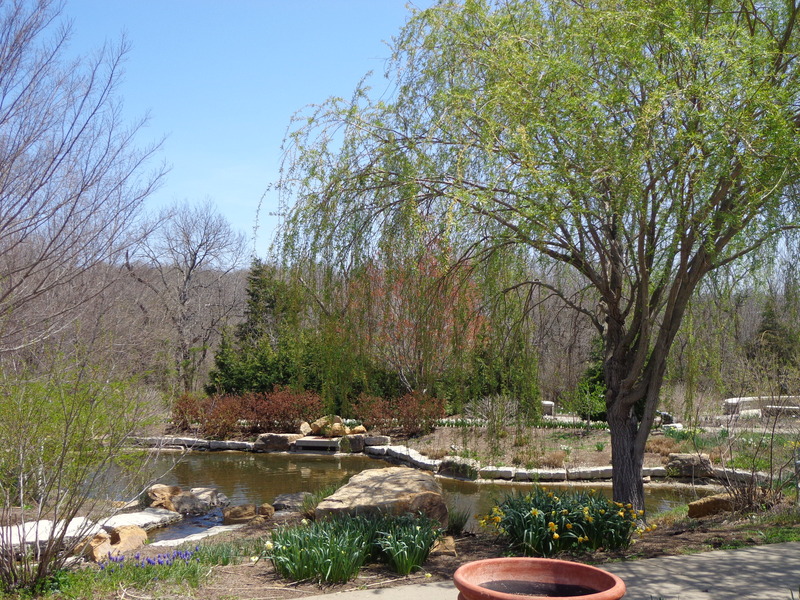 I recently went to a local arboretum. Beauty for ‘early spring’. I glue the first piece down. 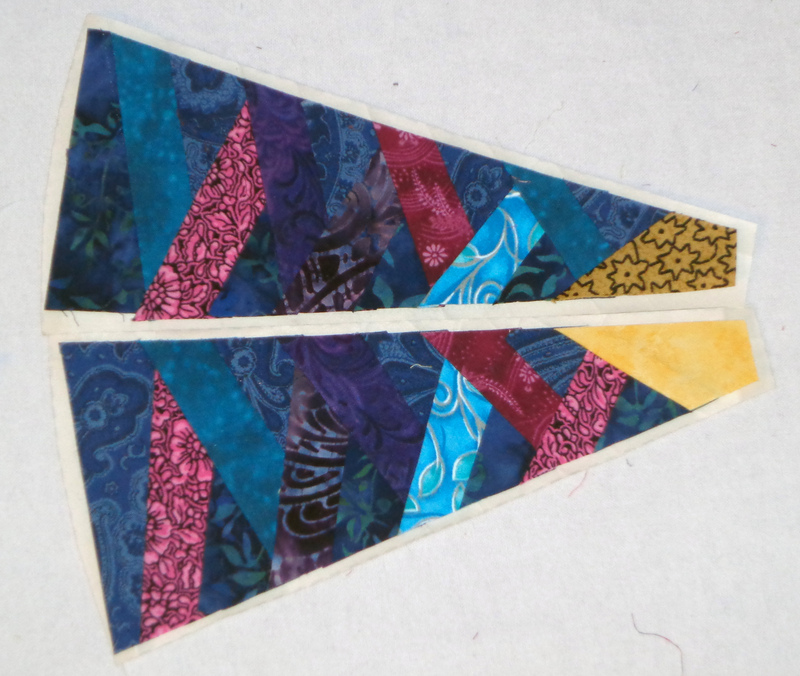 I cut my strips into sizes that I may try to use later, such as 5″ by width of fabric, 3.5″ inch strips by width of fabric. 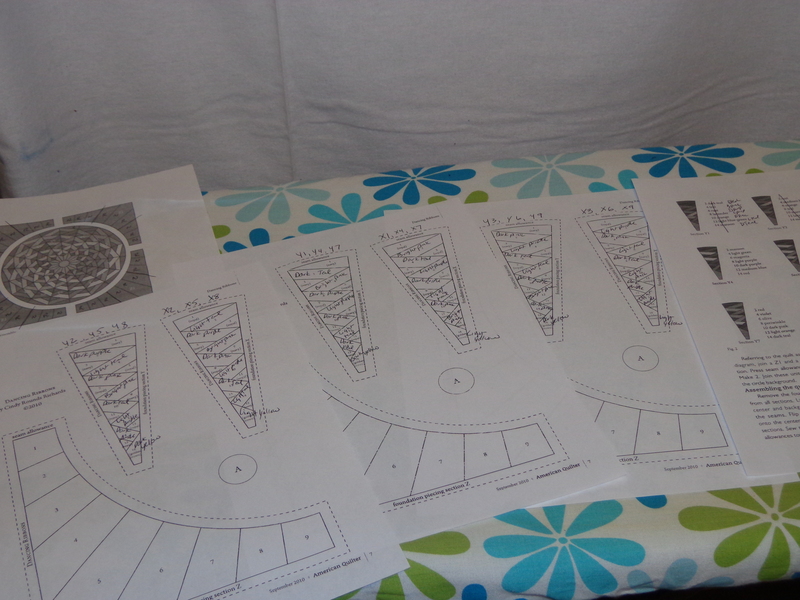 Especially when I am deciding the size needed for the rest of the pattern. I don’t trim off the quarter inch or eighth of an inch in between seams. Unless there is a seam ending in the middle somewhere. 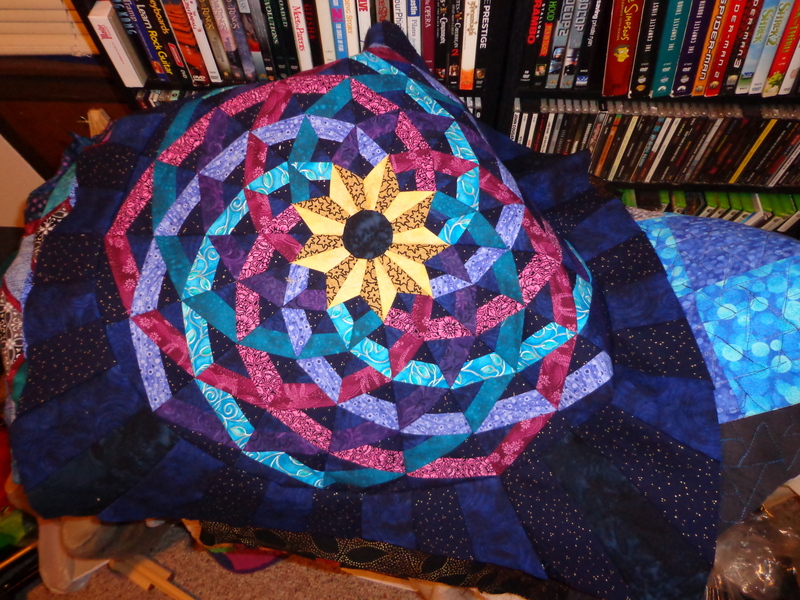 Or unless you plan ultra bulky amount of quilting on the piece. 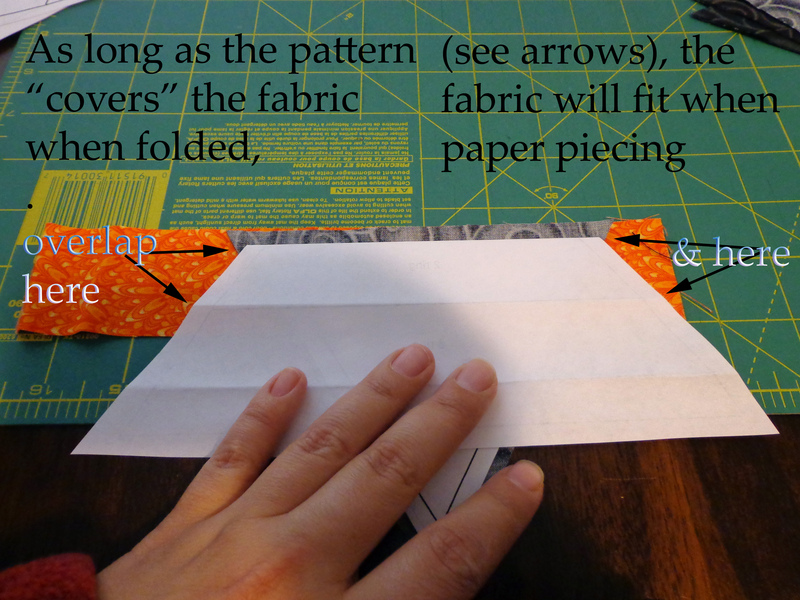 I prefold my paper before sewing. 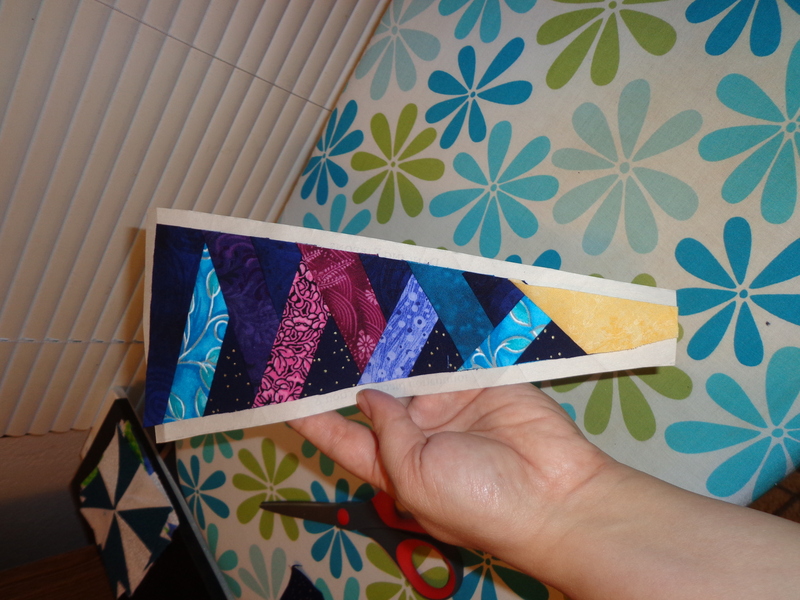 And I prefold all the way down the length of the paper. Make decisions that make sense for you to help you stay organized. Do things that may help you out in the long run. Always put the dark fabric in a specific place if it doesn’t matter to the design. 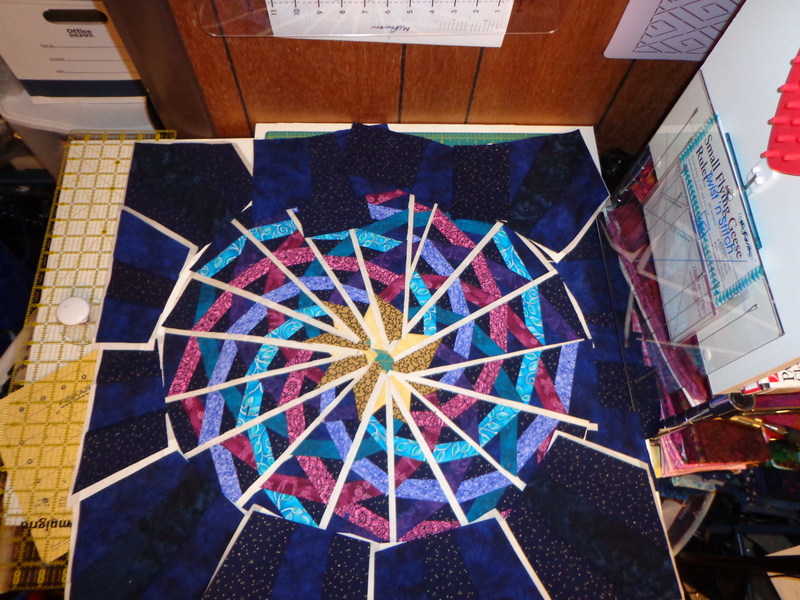 Make one copy of one block before moving on to chain piecing or cutting all of them, you may save on fabric if you try out something first. I pin down the other side of longer seams to help it stay in place, but I don’t pin the whole seam unless I fear it shifting around too much. 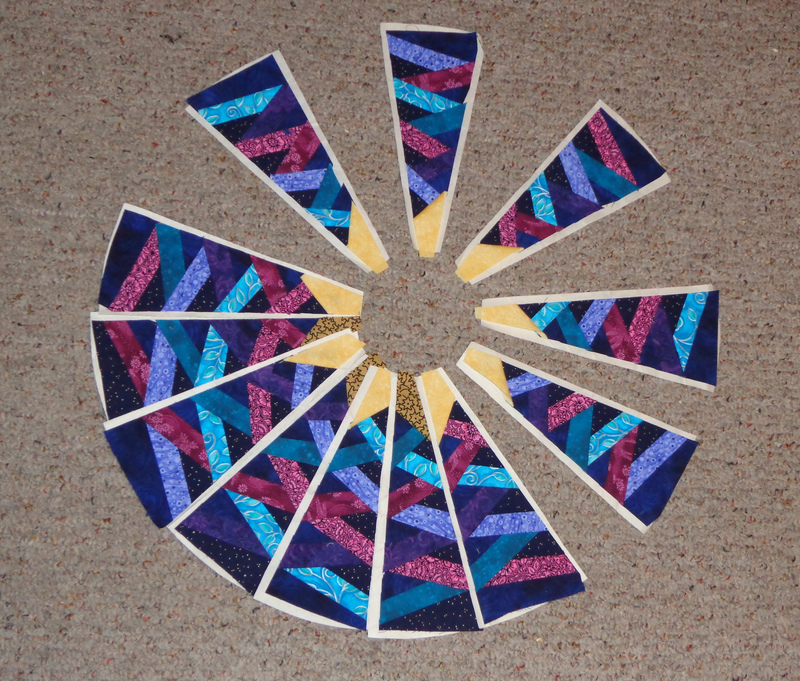 Carol Doak’s paper piecing is wonderful, use it for times when you have either intricate or small patterns when pulling out paper will be a pain in the bu*t later. Regular paper also works okay. Incompotec.com graph paper of all kinds, shapes, & sizes. You print off what you need in handy 8.5 X 11 pieces, downloads to PDF files. 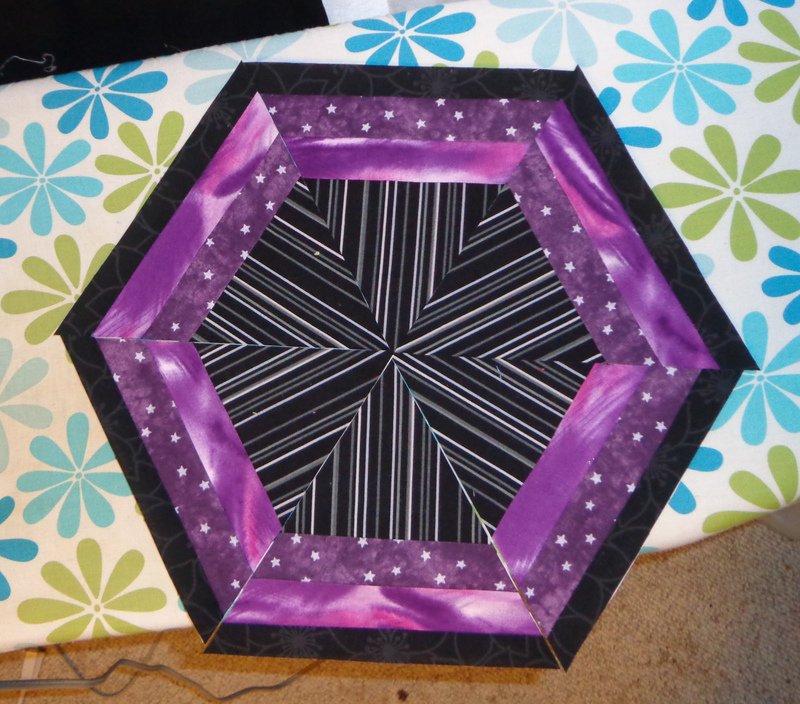 Craftsy paper piece design for Hexadaisy. 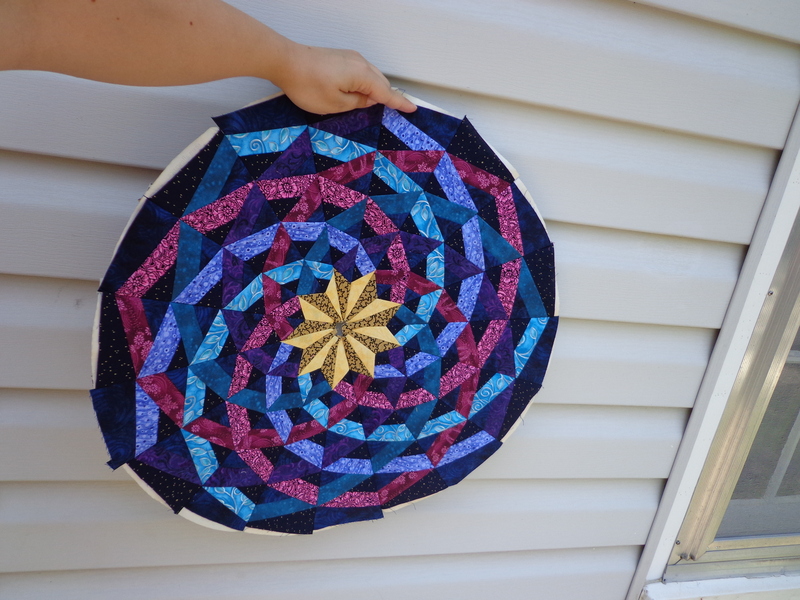 The love it / hate it / love it / hate it block for the hexadaisy with stripes. 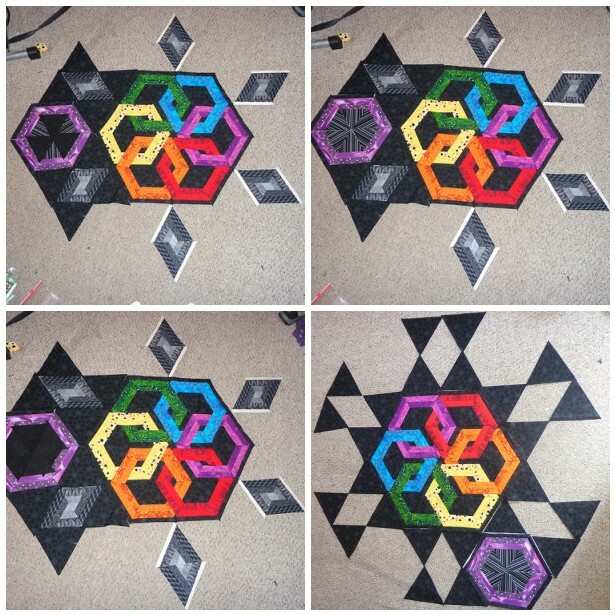 I bugged about everyone I knew online to see what they liked better, but shows my decision in making the design. 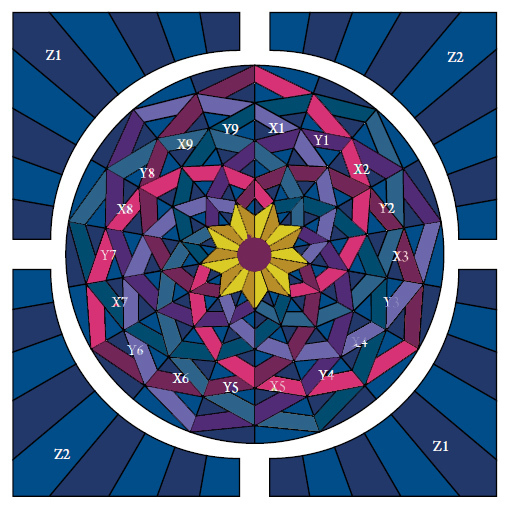 I picked the 5th option not shown below – combines the left half with the right half of the mosaic below – which was always intended (some people didn’t know that). I ultimately decided (finally) to use grey swirls instead. 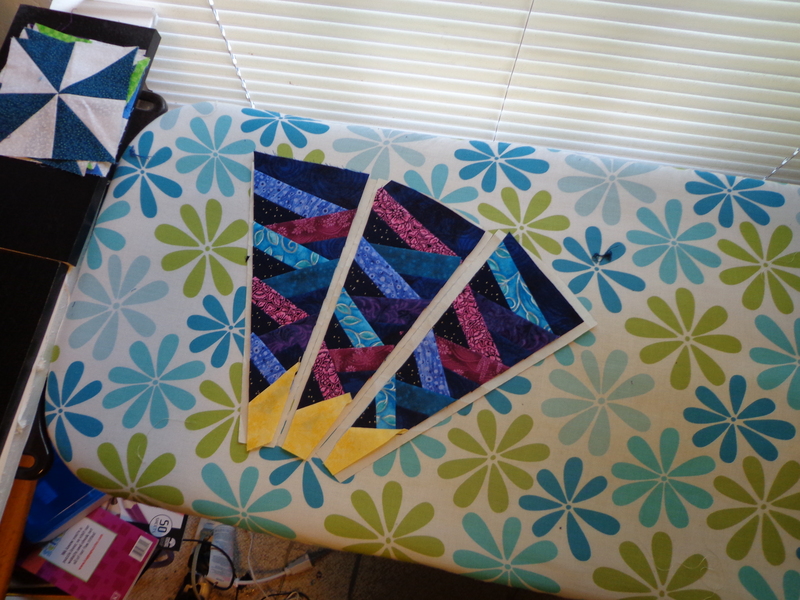 I love the stripes and striped pattern will work on it’s own in a different quilt. 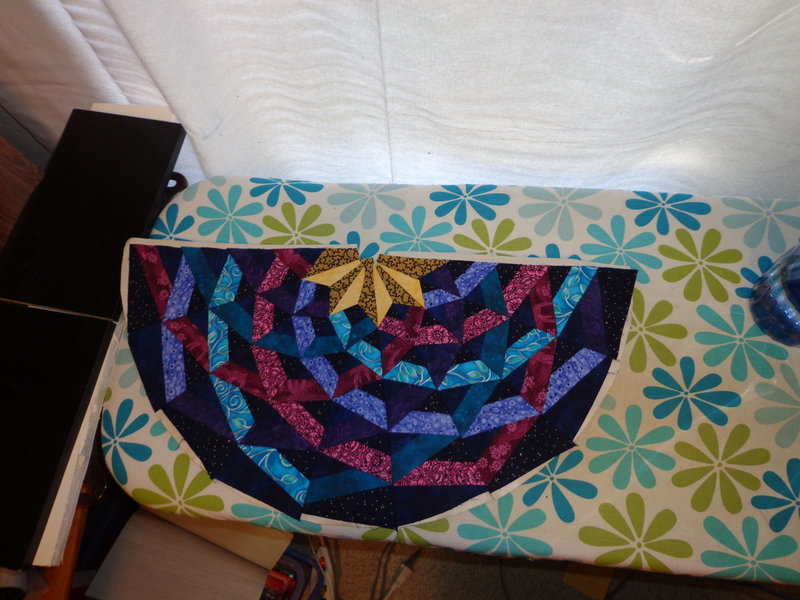 But NOW the stripes are gone for this project as they were TOO DEMANDING of my attention. 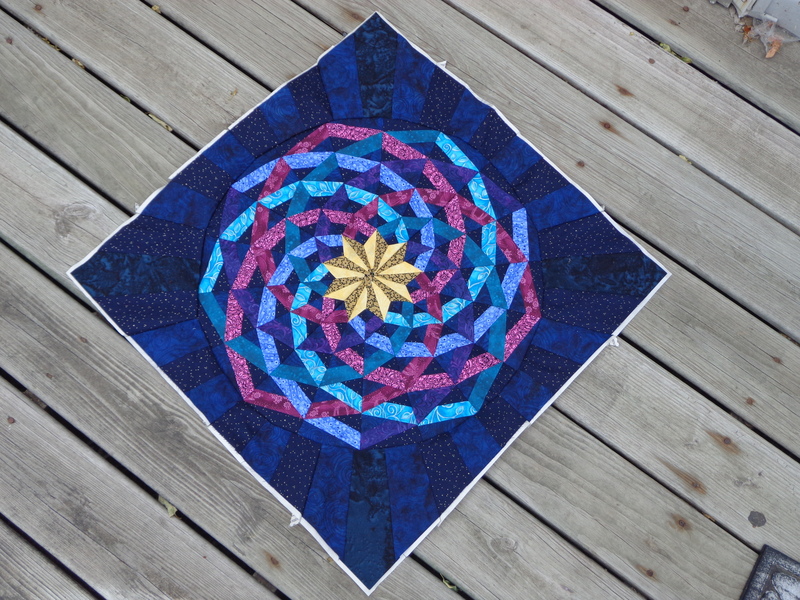 The version is going to the quilt guild auction in July. When it’s quilted. A completely random couple of notes tacked on. 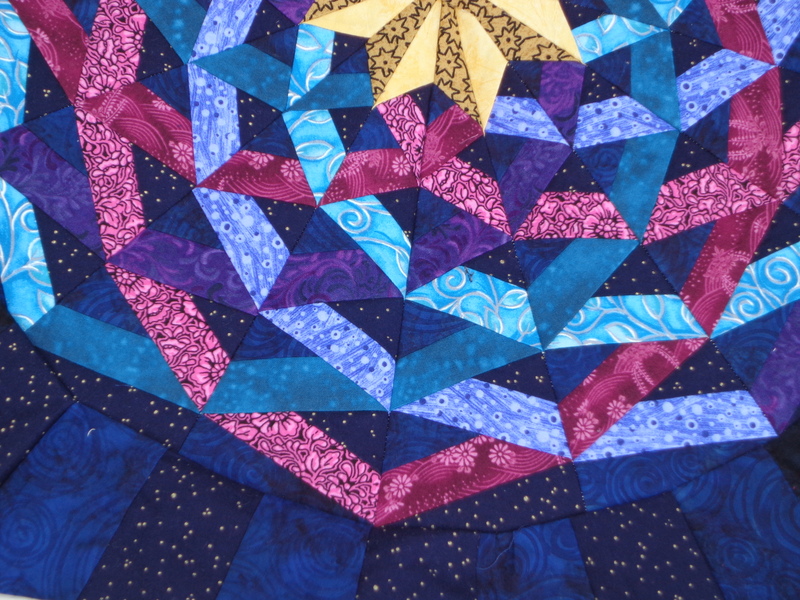 Be careful at a quilt show in case of emergency. 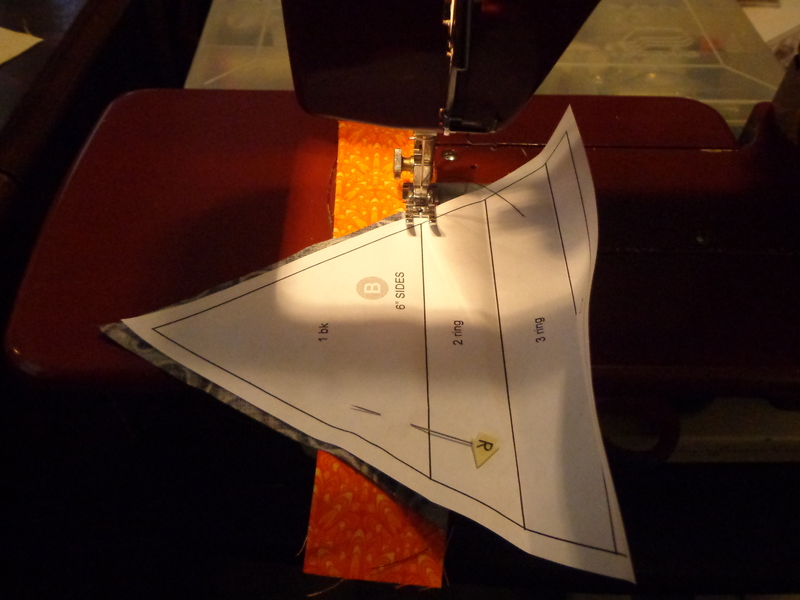 See if your quilt guild has insurance in case expensive sewing machines become damaged. A guild close to mine had a problem at a local show recently. 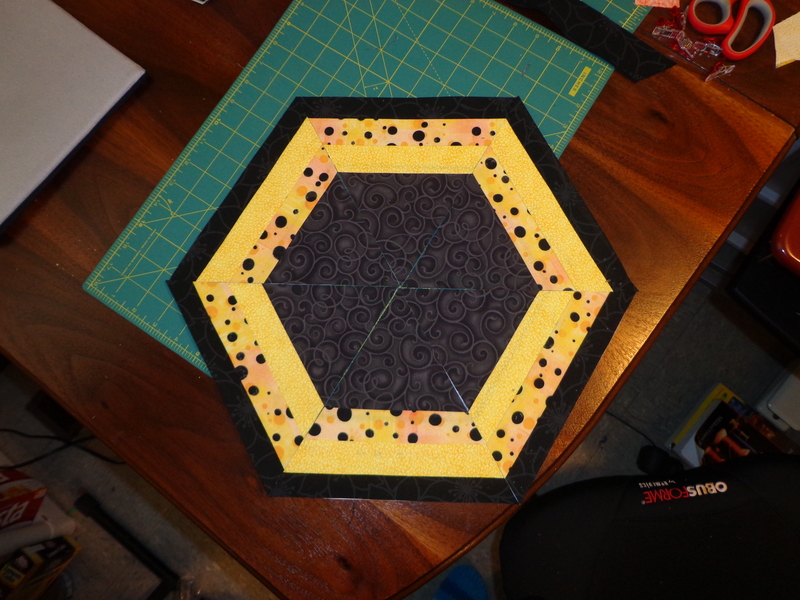 Also don’t forget to finish making blocks for other quilters if you signed up to do them.